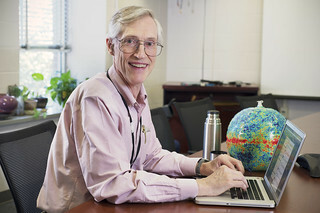 These are the answers Dr. John Mather (Nobel Laureate and James Webb Space Telescope project scientist) gave to questions asked on Twitter during our first Tweet Chat. The answers are very succint due to Twitter's 140 character limit (and we also added the #JWSTscience hashtag to each answer). Often the questions are rephrased in the answers so that our Twitter followers would know what we were giving the answer to. A: Why L2? It's close to Earth and the sunshield protects the spacecraft from both Sun and Earth at the same time. A: How will JWST find habitable planets? It will observe planetary atmospheres through the transit technique. A: Yes, #JWST will be able to measure what exoplanets' atmopsheres are made of. A: How far back will #JWST see? We can see the first objects that formed 200 millions years after the Big Bang. A: Can JWST detect pollution in exoplanet atmospheres? We're not expecting to find it, but JWST could detect chlorofluorocarbons - CFCs. A: Can something be so cold it emits radio instead of IR? Yes! The Cosmic Microwave Background emits at millimeter & microwave. A: We will look for the first luminous objects but the very first light was the Big Bang itself. The heat of the Big Bang has been seen already - it is the Cosmic Microwave Background. A: We will absolutely image objects in our solar system. Except for those between the spacecraft and the Sun! A: JWST will be able to measure the gravitational effects of dark matter on galaxies & will measure dark energy more precisely! A: Will JWST continue like HST? We expect to continue doing wonderful science as long as the observatory is alive! A: Why IR? It's almost unexplored, you can see the highly-redshifted earliest galaxies, & see stars form inside dust clouds. A: Our goal - to help understand the history of the universe, from the beginning to the future and our place in it. Another goal of #JWST is to help understand the conditions leading to human life. A: We will launch on an Ariane 5 rocket. A: We'll see back to 200 million years after the Big Bang, and hope to discover whether the first objects were stars or blackholes. A: Great WMAP page on dark matter/dark energy: http://1.usa.gov/1hLZwo JWST will add to our knowlegde of dark energy. A: If Earth were an exoplanet it would be too close to the Sun for JWST to see it. Would need to be brighter/more distant. A: Rocket propellant is the only life span limiter for JWST. We are carrying at least 10 years supply. A: In-space refueling of #JWST? Logically possible but difficult. It would require robots! A: It's so magnificent we can't imagine turning it off! As long as it stays alive, we suspect it will continue to do great science! A: Our resolution is better than Hubble and we will see early galaxies when they were young by using infrared. Also, Hubble can't see the very first galaxies but we will be able to. A: Our pixels are .032 arc seconds. A: Is JWST or Hubble better for looking at our planets? Each does different science. IR gives a different view! A: What if the dark ages weren't really dark? I guess that's something that will need some light shed on it! A: JWST wasn't designed for servicing (would be very expensive to build it that way) and it is also very delicate.